So I've now played two games with the only other wargamer I've been able to find in Delhi. 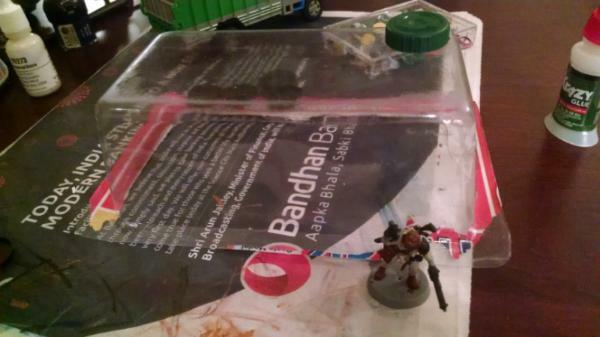 He had the Dark Vengence box and some additional BA's I've got 20 Inquisition guys, trucks and cargo containers. What we need is more and better terrain. I have tons of terrain, on a boat, in the Pacific Ocean. So I don't want to go out and spend money. 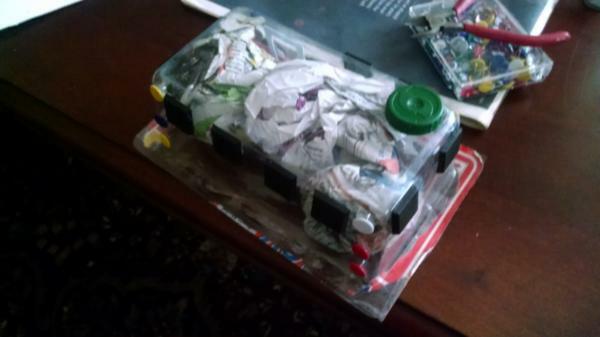 The blister pack of course is way too light so I stuffed it with newspaper to give it some mass. Someday future archeologists will find it and use it to learn the secrets of life in Delhi before the Great Cataclysm. And with a coat of paint it ain't half bad. Now I have to figure out what to scrawl on all those flat surfaces. So one of the kits I've been using is the Empire Outriders. I've been using the heads, the cloaks, the guns, the holsters everything except, well the horses and bodies it actually comes with. So I figured, what can use them for? Then I remembered I don't have any rough riders for my Tallarn army! Not that RRs are all that useful but it would be nice ot have some right? Now of course I'm not just going to order 5 of them, no that would be silly, I got 15 so I could build 5 RRs and then a squad. They don't fit! It's like he's wearing his daddy's pants! The left over hand guns however do fit. Sniper rifles maybe? 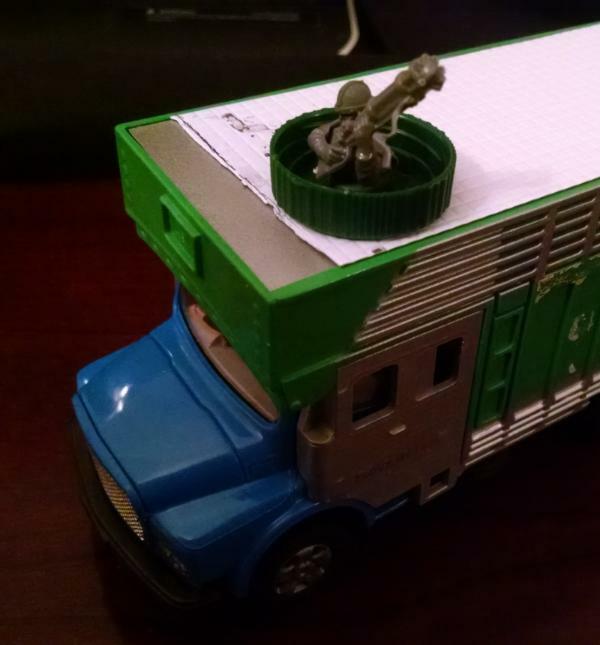 Toy truck+bottle cap+leftover bitz=gun truck! Maybe I'll try and do a Calidus for my last handgunner body. 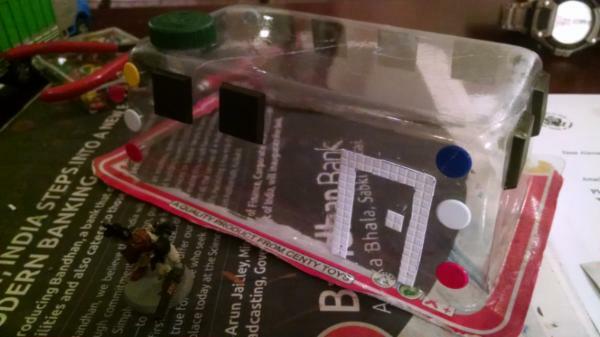 Or add some stuff up there with him in the bottle cap, that is an awesome idea I am stealing. Well I can start drinking a new brand of juice, or maybe add a half circle of plasticard turn it into more of an armored cupola than well, a bottle cap. Wow, I'm so glad I found this thread! Your fluff is great and the kitbashes are really cool. I hope your stuff makes it through the Pacific soon so that we can see some more work! Let's see the big news is I got my stuff! Boxes and boxes of unfinished projects just waiting for some love! The flip side however is Mrs Kyoto, Kyoto Secunda and her Clone Sister Kyoto Secunda Prime have arrived which significantly eats into my hobby time. ARG! I can have models or time, but never both! I feel like that guy who was the last man alive, with nothing but time to read... then he broke his glasses! But I've snuck in a few small things. "Hill men? Why do we need their kind of scum?" Arbiter Bullox snarled. "Under nourished, illiterate, foul smelling-"
"Snipers who can blow out your eyes from half a mile away." Inquisitor Ardor finished with a smile. "True, true" Bullox muttered, casually trying to put a truck between them and his head. "But they're mercenaries. They're not fighting for duty or faith, they'll turn on you the second someone outbids you." "Maybe, but we'll just have to make sure the Holy Inquisition is paying better than anyone else." 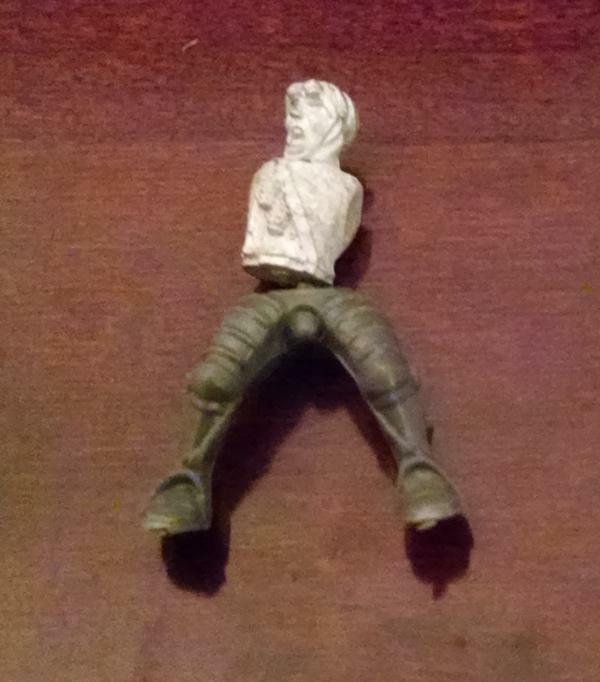 Curious Construct bodies, Empire handguns and IG kneeling legs. 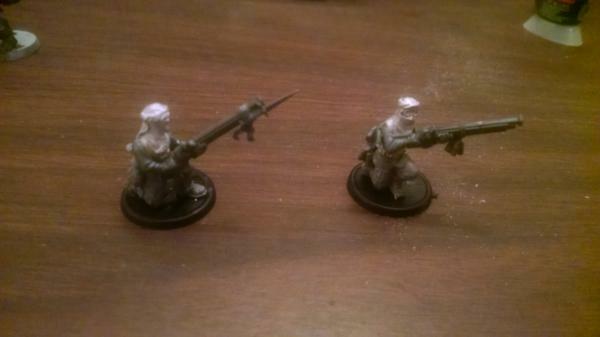 I think they'll count as Ratlings or maybe vets with sniper rifles. Question, given the rise of ginormous robots who for some reason count as models, is there a new role for the sniper rifle? Would someone even consider fielding 10, 20 or 30 ratlings? Would it work? Anyway, also made some progress on my quick and dirty Emperor. Maybe I'll do a quick SIgmarine Horus to go with him. Ooh...neat Emperor conversion. I have something similar in progress, but not to represent His Holiness. Nice work. "Are they serious" Danil Ardor muttered as the Dromedary Personnel Transport bounced along the cratered road towards the first check point. In the distance the Iron Tower of Will, the Inquisition's headquarters on this backwater world loomed. He squinted again looking into the red sun set. "Emperor help us all. They really build it." So years ago I did a big stupid project I called Happy Acres. filled a whole table with Pegasus buildings. Then I made something even stupider. A massive bridge that could easily fill a whole table by itself. And now I find myself with some time and by oddest coinicidence some Pegasus gothic kits. "They really made a giant tower shaped like an =I=... why would someone even do that? Are they worried we might forget who we work for?" The Iron Tower of Will will be the new HQ of my army. Since I did this initial build I've made it deeper so it's a bit less comical and started trimming, filing and glueing. 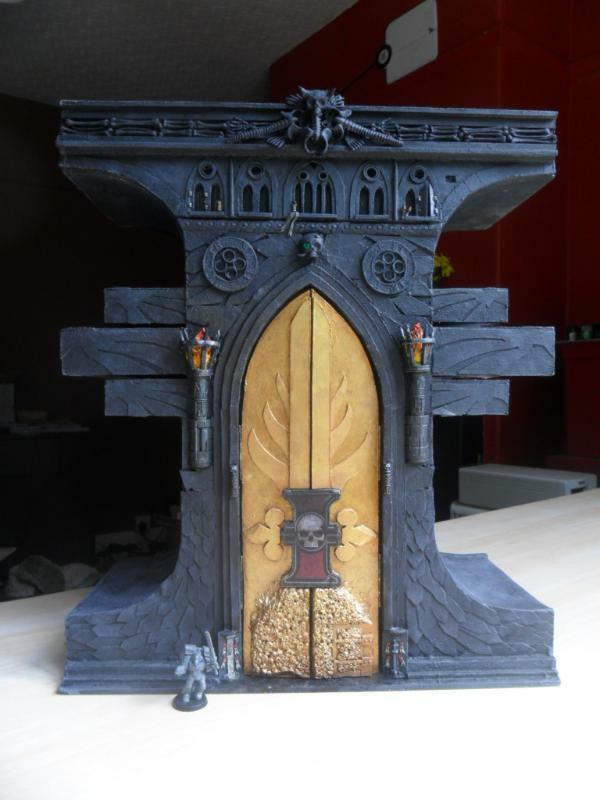 The center part will use Cities of Death walls and have a balcony for the Grand Inquisitor to stand on and look out over his assembled hoards. There will of course be guns and flair, I won't try to make into any of the specific terrain peices (Fortress of Redemption or whatever) though. This is just terrain. It was my first time using their cathedral kit and I also got their ruins kit for the first time, I'll post reviews of both later. Well that's pretty damn cool! Ardor exited the Dromedary Personnel Transport into the thin, cold air outside. The Iron Tower was on a plateu in the middle of the desert. It took 3 days to reach by land. Normally he'd have requisitioned a Valkyrie, but his superiors warned that anything flying within a hundred leagues would be shot down. Inquisition codes or not. And he had no desire to test that. He squeezed past a Leman Russ tank, its hull covered in icons and ribbons as if it were a rolling temple and not a weapon. He tried to remember what the ones with the big gattling guns were called. Eliminators? Castigators? Liquidators? Punishers! Some ancient hypno lesson came to his mind, it was Leman Russ Punisher... Unwanted statistics about armor thickness and fuel requirements marched through his brain like an unwanted melody. That was the problem with hypno lessons, once you opened that door you had to let it all out. At least it wasn't as bad as the time he tried to remember the name of Xeno craftword and spend the next two days speaking Eldari. So yeah, Pask in a Punisher. The driver is one of the Curious Construct torsos, should look pretty good when it's done. Still needs more flair though. I can still see some hull. A hulking mutant staggered out of some subterrainian access point, a bulky coffin balanced on its broad back. Ardor shuddered as his psychic senses felt a presence whirling around the creature. He let the mutant pass without question. Sometimes even Inquisitors knew better than to be too Inquisitive. At last Ardor reached the gates of the Iron Tower. It loomed above him but Dolor knew he was but seeing the uppermost scales of vast subterranian dragon. The depths below the Iron Tower of Will were easily ten times the size of the tower above him. This is the rebuild version. I made it twice as deep which makes it more balanced both physically and visually. I might replace the Cities of Death balconies with plasticard, they're a bit heavy for the small join they have with the walls. 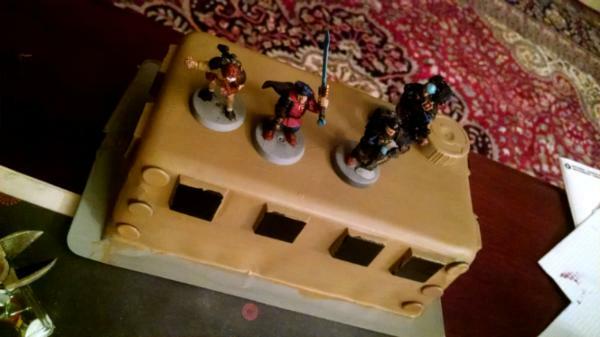 It's funny, this is a big terrain piece by any reasonable measure. But in real life this would be a 5-10 story building. Nothing worth a second look. 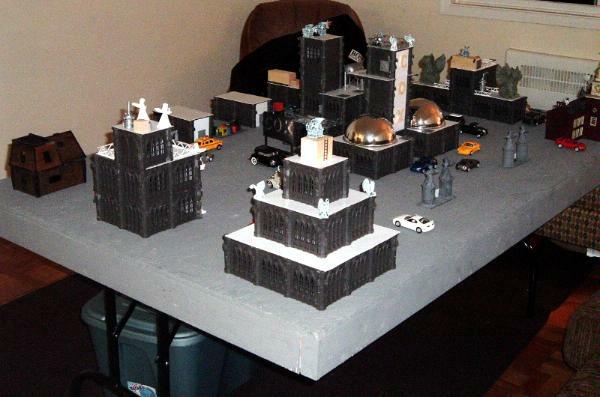 I assume all 40k buildings are undersized to fit on the table top. Or maybe the Inquisition makes use of the technology of lost Gallafray to increase their internal volume. No fluff this time, just updates. I've been painting too, but ntohing to show off just yet. The Iron Tower of Will is taking shape. I bitz ordered the eagles from the Wall O'Dead Cadians and to my joy found they fit perfectly on flat surfaces! They're a bit costy $13 for 8 but added so much to the tower. Roofs are on and tonight I should finish fitting the various floors together. Then I'll be adding flair and other details. Also made two more cargo trucks. 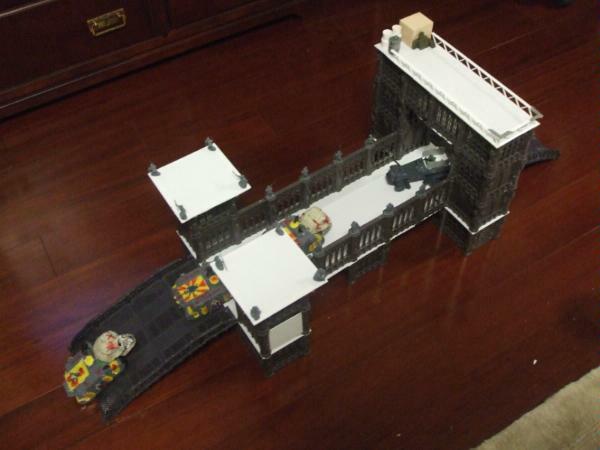 Reaper 'weapons locker' with tamiya stowage and some GW stuff. 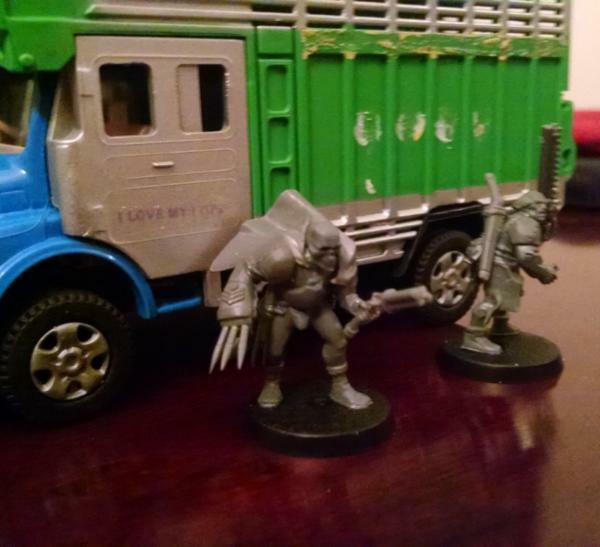 The weird thing about buying toys is the cargo bitz cost several times what both trucks cost. The tanker is the old reliable Pegasus Chemical Plant (great kit everyone should buy) with Tamiya (allied stowage kit, another essential IMHO) and resin sci-fi crate. After some thought I decided that fuel and water were just too predictable and not nearly grimdark enough. And of course mother's milk was just done in Mad Max. So I decided it's hauling memory RNA, brain fluids harvested from surplus and obsolete workers which will be injected into new workers to save on all that tiresome training and conditioning. Coming up some RT and 2nd edition model painting, more Iron Tower of Will and a Technical to protect those valuable memory RNA shipments. Should add some improbably placed guns on there. Maybe an anti-infantry emplacement on top pointing towards the sky, that's proper grimdark. Well it is a strong hold of His Divine Emperor's Most Holy Ordos. I mean if you got to the front gates, past the IG regiment, past the crusaders, past the death cultists, past the rest of the freak show, either you belong there, you're a prisoner, or the Inquisition is so it makes no difference any more. Oh yes, there will be guns. The Iron Tower looks amazing. In fact the shot of your board of scenery looks great, you've made some really interesting terrain. Thinking of mounting the quad gun upside down under the 5th floor overhang. It would add something visual to that corner and, of course, look properly daft. Took a bit of a break from the Tower to do some painting and smaller projects. And I did some work on the 1000 Maniacs, including a long-overdue census. First off some 2nd edition Cadians (and a few 3rd) who've been promoted into Astra Militarium Militarum Tempestus Scion Storn Troopers. And then the 1000 Maniacs themselves! 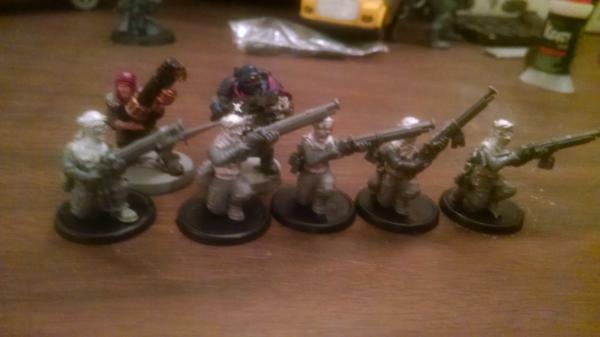 Redemptionists, Cawdor, a few Orlocks and some Mordians. I can do something like 3 full platoons. 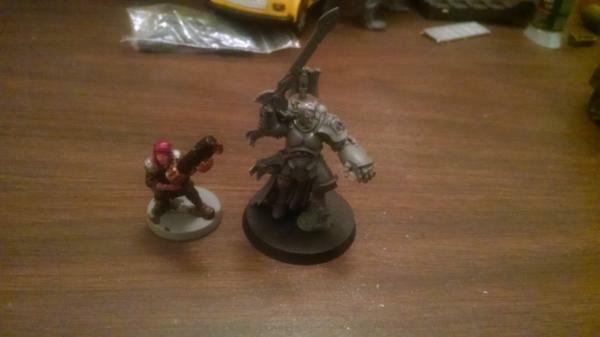 More to come as Inquisitors and some RT refugees get paint. Some major progress today, primed it (black then grey), dry brushed and started some detailing! Added some details but left a lot of flat surfaces to minis to stand on. I've not painted the center, Cities of Death portion yet, I'm suddenly ambivalent about it. I might replace it with 2 more Pegasus floors to make the whole thing taller and match better. Landing pad needs a lot more work. Valejo's orange fire just does not seem to cover well. Then I have to experiment with hazard stripes. EEK! Awesome conversions and I love the terrain piece. Are you running it as a pure Inquisition force are are you adding in IG allies? Maybe I missed that post but either way the army looks like its coming along well and will look very novel on the table top. GW should honestly hire you to write a supplement or something. Your 40K stuff is exactly what I love about the setting and is the only stuff that makes me feel enthusiastic about it at all these days. Love the buildings, and the conversions are all great. So there's been some progress and I'll do more photos and uploads later. Among other things we fought the biggest megabattle Delhi has ever seen with 5000 points! Which don't sound like much hey there's only 3 of us here. Including some more weapon emplacements, more cars, more scatter terrain and other odds and ends. Heavy Weapon bases for my Necromunda heavies. Tamiya and Italiari walls and sand bags. Lazy but functional, a Tamiya brick wall. Long enough for 5 models. They're only detailed on one side! So they sat and sat and I was about to throw them away when I noticed all these left over Tamiya brick walls that are functional but dull. So one thing led to another and now I have a bizarre little building that makes no sense (bricked up windows, doors that lead nowhere) but has a lot of texture and character. And if you've spent time in really old neighborhoods you know there are real buildings like this that have been built and rebuilt so many times none of them make sense. Painted up well too, now I just need to add posters. These two ended up on my painting table at the same time. 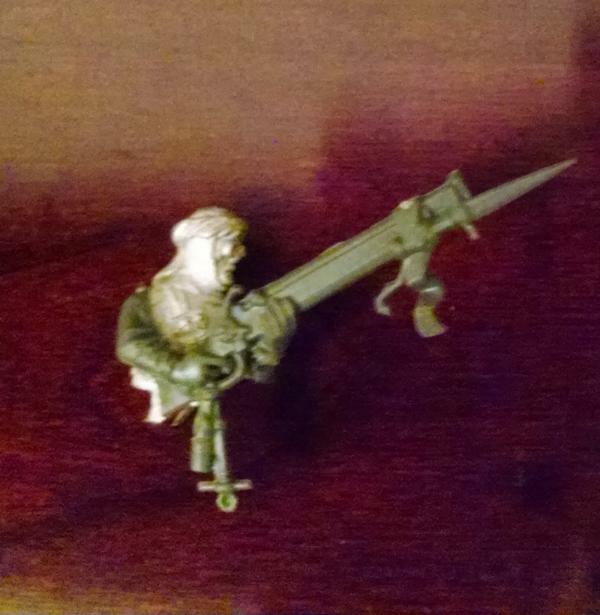 Hasslefree's Capt Goodwin and GW's Cadian Captain, sculpted by one Jes Goodwin Esq. Have to figure out something to do with them both. Tomorrow I add a new middle to the Iron Tower and try to get that painted in a day. We shall see. Nice use of terrain on those weapon emplacements. Also really like the civilian vehicles commandeered for military use. Oddly enough I decided on almost that, an AA gun pointing down at the ground. It will be a quad gun mounted upside down on the overhang of the roof. I considered covering the tower wtih impaled corpses or something but in the end it would make it too busy and somehow I feel the Imperium wouldn't go for that. They'd torture heretics and cremate the bodies, not keep their heretic carcasses around to show. The ruined cottage painted up great. Here we see Captain T'kirk confirming with his closest advisers in the ruins of a brick hovel. After decades of war, propaganda posters are the only remaining decorations. And again, it's mostly made from a 1/72 (WRONG SCALE EVEN!) Italiari kit I got 7 or 8 years back and was about to throw out because it's only detailed on one side. And I got another Pegasus kit so I can do the final revisions on the Iron Tower of Will. You can see the new center area, with a scaled down balcony, an extra story and some banners which will let me add some color to the center. I also added some Firestorm las cannons to my fortifications. Still need to add the upside down autocannons to the overhang area. I picked up a toy landing craft wondering if I could make some sort of shuttle or landing craft out of it. But it's too narrow for Chimeras or Rhinos to fit (it's like a quarter inch too narrow!) and soft waxy plastic (PVC?) so it'll be hard to glue or paint. I might find a use for it down the line but for now it's going into the mountain of shame.